In the two weeks that have transpired since the [/mix/challenge/wholegrainchallenge "Whole-Grain Challenge"] began, I've learned a few strategies for making sure I eat grains every day, at (almost) every meal. The first lies in stocking the pantry. A field trip to Bob's Red Mill yielded many bags of nubby, golden-brown bits, aka whole grains. With a pantry bulging with oats, rice, variations on wheat (bulgur, wheat berries, kamut), as well as rye crackers and popcorn (good snacks), the excuse of "there's nothing in the house to eat" simply doesn't fly. 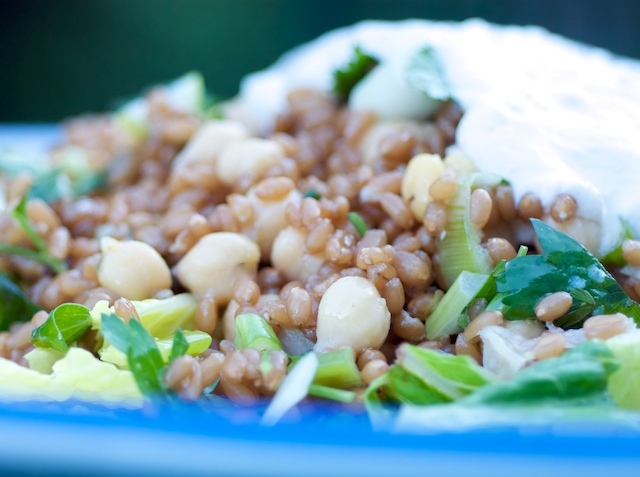 [%image reference-image float=left width=400 caption="A bowl of grain salad makes a sublime lunch."] Breakfast, I've found, is an easy meal at which to eat whole grains. If there's time in the morning, I'll make a pot of oatmeal or whole-grain pancakes. Otherwise it's granola — which I made a huge batch of last week — or whole-wheat toast topped with jam or a soft-boiled egg. Having a stocked pantry, however, means nothing without the second strategy: cooking. Unless I want to eat raw whole grains, which I don't, cooking is required. Cooking in large batches ensures easy, future meals. (Exhibit A: Granola.) My favorite lunch is a bowl of grain salad — quinoa, wheat berry, bulgur — with a piece of fruit. If there's no salad in the fridge, I'll make a quesadilla with corn tortillas or a sandwich on whole-wheat bread. Or eat leftovers. Leftovers lately means a lot of brown rice, which brings me to the third strategy: preparing large quantities of whole grains. Lorna Sass, author of Whole Grains Every Day, Every Way, calls this the Grain Bank: purposefully cooking more grains than needed to turn leftovers into future meals. Having cooked grains in the fridge means it's a quick trick to fold them into other dishes: rice into burritos or a stir-fry, millet into soup, quinoa into salad. As for dinner, I've been rethinking it: Overrated. (Just kidding.) In truth, with the Challenge on my mind, I'm looking at dinner through a new set of lenses. Instead of building a meal around meat, I think Grain and put it at the center of the plate. I consider what sounds good, then brainstorm which grain I could marry to both satisfy the craving and meet the contents of my fridge or freezer. Examples: Italian Sausages with Polenta and Tomato Sauce, farro with sautéed leeks and roasted vegetables, brown rice with stir-fried greens and ponzu. Putting grains front and center, instead of relegating them to Side Dish, is the best way I've found to guarantee a serving of whole grains at dinner. This leads me to the fourth and final strategy, which is really the Überstrategy, the one that underlies all of the above: Planning. Without planning, stocking up and cooking large mean nothing. What works best (but doesn't always happen) is to jot down a week's worth of meals and a grocery list, with an eye on the calendar to make sure my ambitions aren't out of line, then shop and cook accordingly. All the grains in my pantry and recipes on deck to try — amaranth cookies, injera bread, saffron quinoa, millet pie — will languish without a plan. As will those leftover cooked grains.